Find the navigation settings that work best for you. MURAL canvases are huge - which is great, because you can keep a ton of stuff together in one place. But what about when you want to seamlessly get from one side of the mural to the other? Or zoom in on an area to edit it? Optimize the way you navigate in MURAL by following these steps. 1. Mouse over to the bottom-right corner of your mural. 2. Click on the "Zoom Settings" bar that appears underneath the mini-map. 3. Choose the Zoom and Scroll options you prefer. 4. Test out your selected settings in your mural. 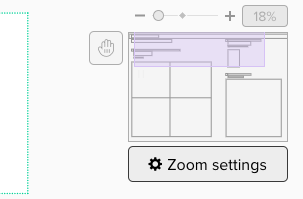 Your changes will automatically save, so you can click anywhere outside the panel to get back to creating cool stuff. Learn more about navigating MURAL and other "zooming user interfaces" (ZUIs) here on our blog.